Band meeting! Jermaine present, Bret present. That's right, New Zealand's fourth most popular guitar-based digi-bongo a cappella-rap-funk-comedy folk duo have made their return to the UK, for the first time in over five years. Flight Of The Conchords have always been associated with a ‘cult’ following, but after selling out their 10 date, nationwide tour in a matter of seconds, including a final performance at London's Wembley Arena, this duo is quickly becoming a hit with the mainstream audience. "Hello Manchester, are you 'mad for it'?" Jermaine Clement, one half of Flight Of The Conchords, asks the sold out Manchester Apollo in his best Manchurian accent. "Yeah that's right Manchester, we've googled you!" Tonight's display is a mixture of songs, from the two seasons of the duo's hit HBO TV show, hilarious banter and crowd interaction. "We asked where we should go after the gig and the guy said “No! You don’t wanna go out on a Saturday night! You’ll get stabbed!” So we’ll probably stay in and watch some TV. Was anyone stabbed on their way here today?" Bret McKenzie asks the audience, which is greeted to a response of cheers from the crowd. “Good! A couple there, it's good to get stabbed early on, get it out the way." The show opened with the duo arriving on stage, wearing flashing robot-boxes on their heads, performing 'Too Many Dicks (On The Dance Floor).' The night doesn't go astray without the classics, 'Ladies Of The World' and 'I'm Not Crying' but the applause is saved for the encore, where 'Business Time' and 'Hiphopopopotamus vs. Rhymenoceros' are played. After a two hour set, the closer of the night is a slowed-down, re-arranged version of 'Suga Lumps'; which included Bret jumping on top of a gentleman in the front row, inviting him take a closer look at his 'Sugalumps', as well as a young lady being asked to come on stage to touch Bret's 'bouncing Sugalumps'. Anyone who hasn't seen Flight Of The Conchords in concert is really missing out. It seriously is impossible for anyone in attendance to leave displeased. 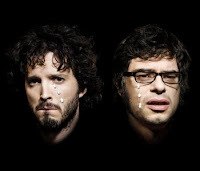 With the TV show now at an end, as we know it, no one is really sure if this is the last time we will see the Conchords again. But, if so, Bret and Jermaine, thanks for the memories!